I had no special plans for Monday, after finishing my long post about the road trip, so I set off to look for a meal. 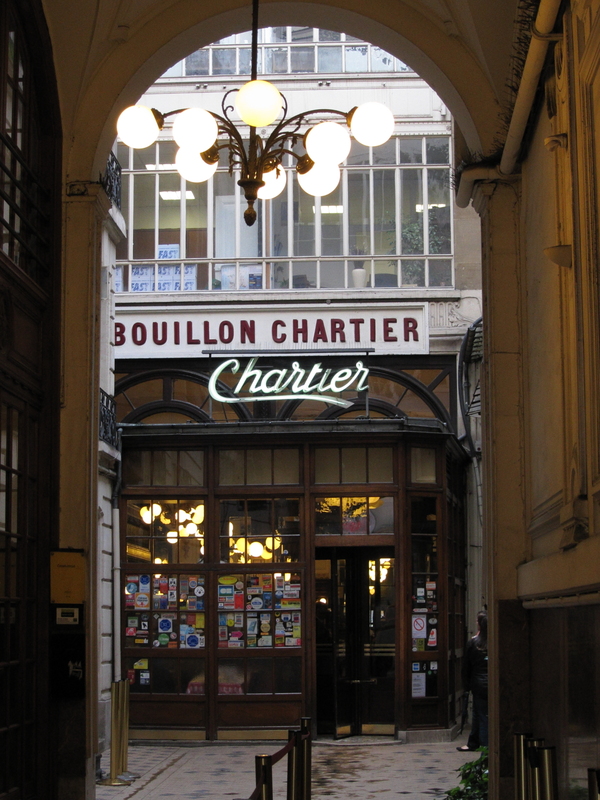 I wasn’t sure what I wanted, but at length I recalled Boullion Chartier, which Hugo had introduced me to my first year. It’s a Parisian landmark, serving classic French cuisine at reasonable prices. 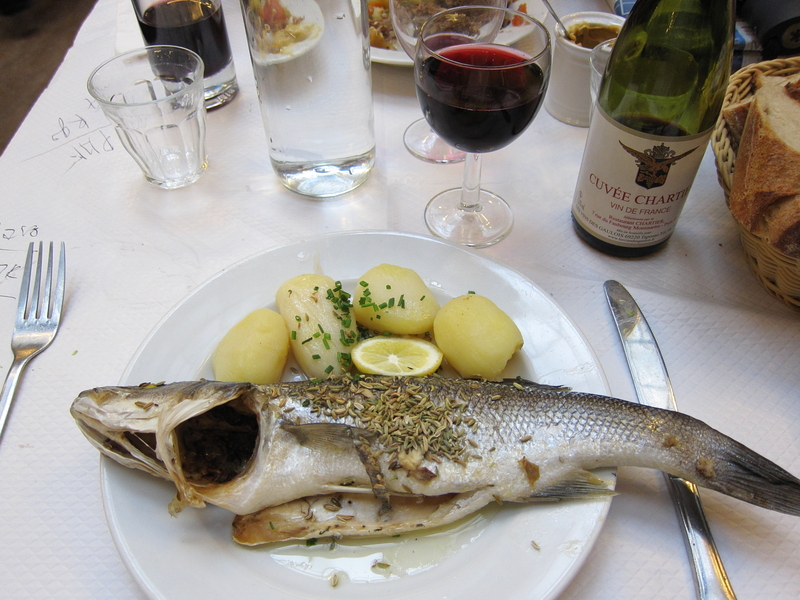 Whole sea bass (bar entier) at Bouillon Chartier. One unique feature is that you are typically seated with other diners. This can make it very sociable when you are alone, if you are lucky. Happily, I was seated with a business professor from Montpellier who was both cordial and interesting (and preferred to converse in French). 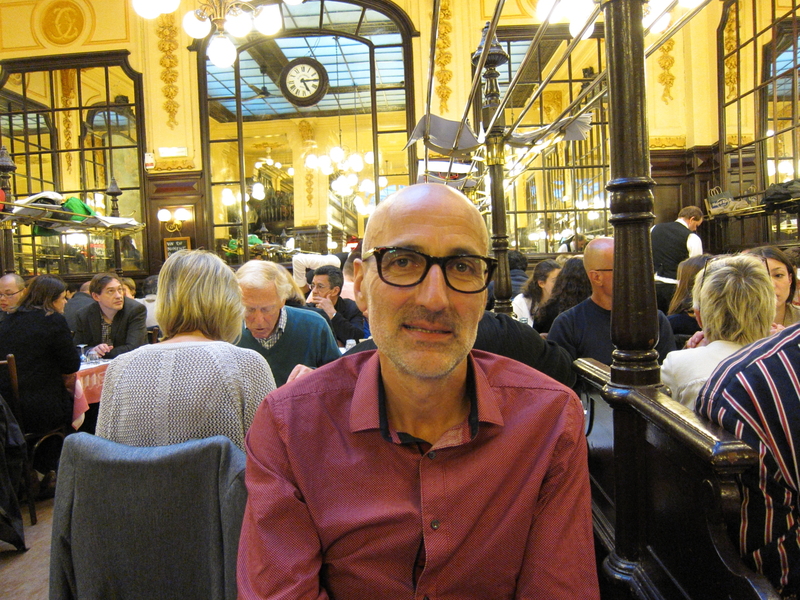 The business professor from Montpellier with whom I was seated at Boullion Chartier. 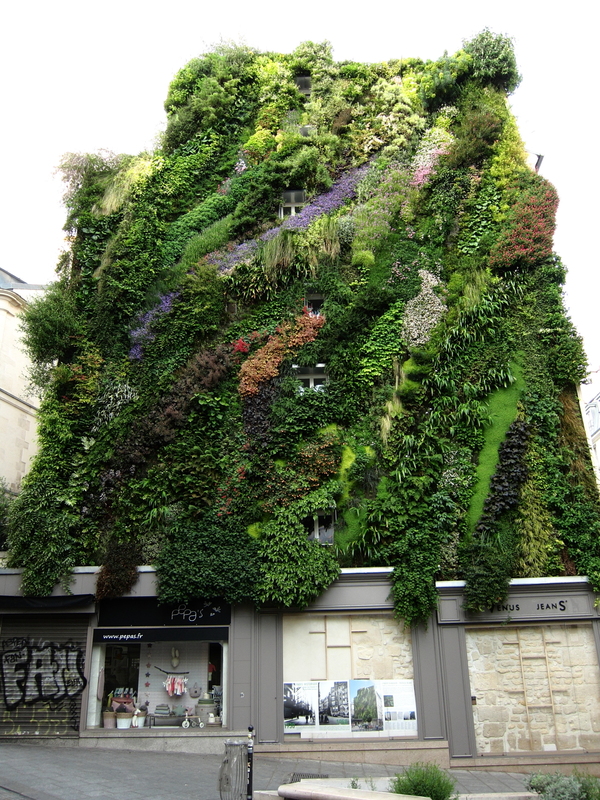 After dinner I strolled back via my old neighborhood, and was impressed by the vertical jungle that l’Oasis d’Aboukir has become, in less than 18 months. On Tuesday afternoon my first visitor arrived, for a two-night stay. David Ayres practiced law with me in Boston half a life ago. He now lives in Prague, where I visited him and his partner in 2010. 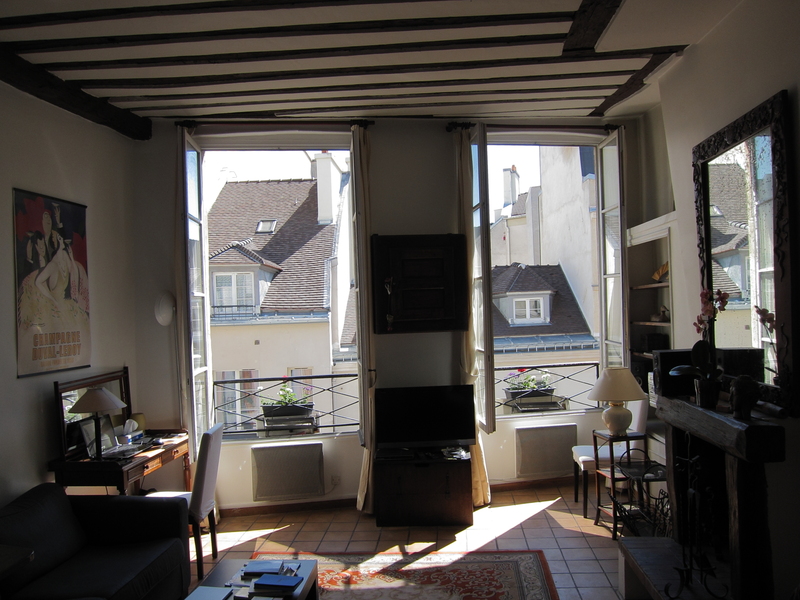 He has visited Paris many times so we spent most of our time wandering — through the Marais, up to Parc des Buttes-Chaumont, around Montmartre, etc. etc. 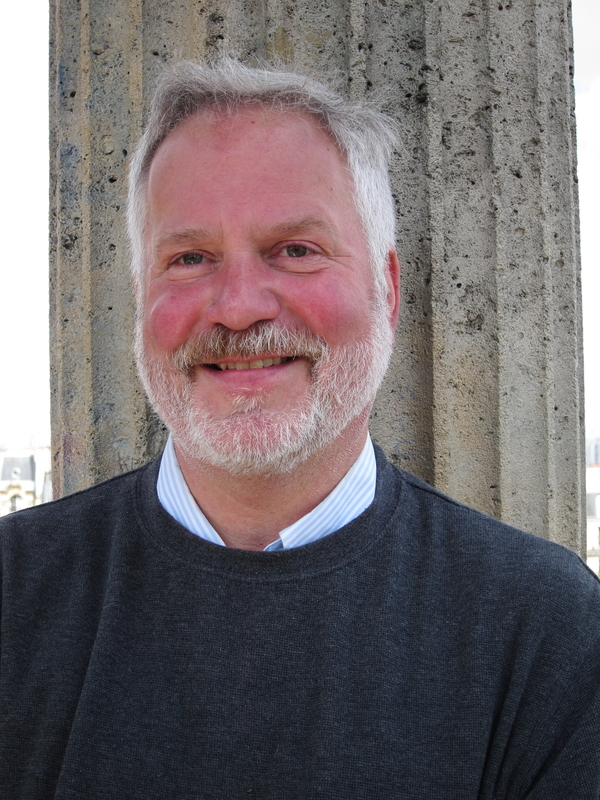 David Ayres at the temple de la Sibylle in Parc des Buttes-Chaumont. Our second day I gave a short tour of the north slopes of la Butte Montmartre. 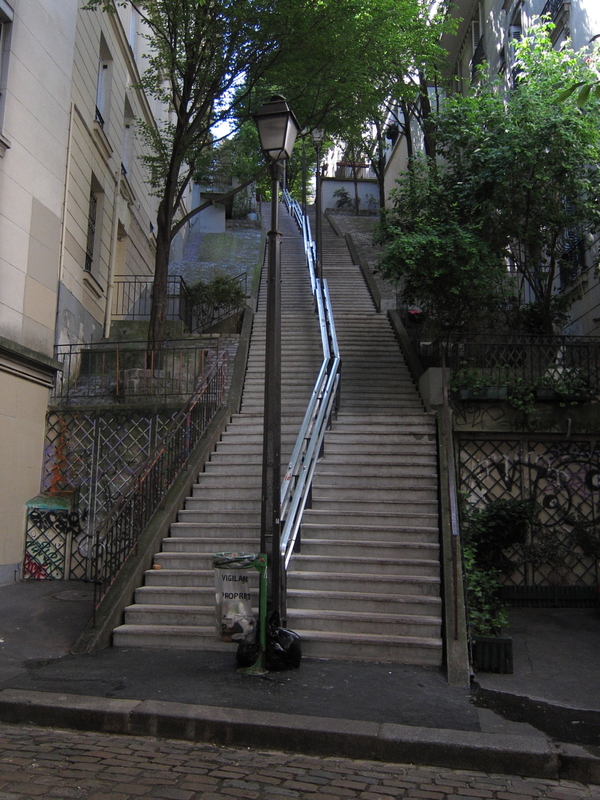 Stairway on the north slope of la Butte Montmartre. Then David led us deeper into the 17ème than I had previously ventured. We ended up having lunch at La Chope Des Vosges at métro Guy Môquet; it was quite ok except for the chilly demeanor of our waiter. David liked the apartment, and helped me improve its ambiance immeasurably by planting colorful flower plants in the front window boxes, and ensuring that we never again run out of seltzer water. 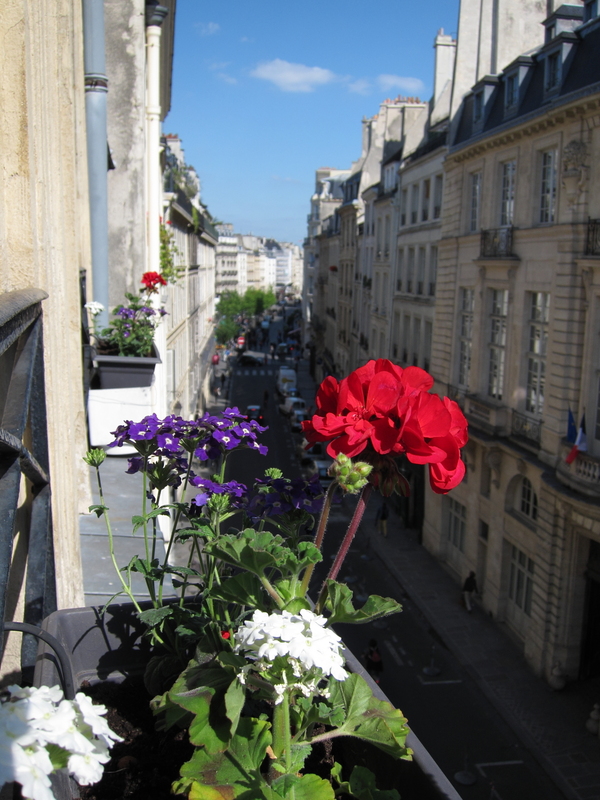 My spring 2014 apartment, looking lovely after David Ayres helped me plant flowers in the window boxes. Red, white and blue flowers and red white and blue flags. Coincidence? On our first evening we had dinner at JaJa, a restaurant in the Marais that I hadn’t previously noticed. It was pretty good, but perhaps not great value for money. Our last evening we ate dinner at Le Gai Moulin, also in the Marais. The food and service are just ok, but the price is right, and the 100% gay diners can be quite amusing. We ended up getting into conversations, in English, with guys at two nearby tables. Their stories were interesting, though we declined a cordial invitation from one of them to pursue a more intimate acquaintance. David headed back to Prague earlier this afternoon. We both enjoyed our flânes through Paris, but catching up on each other’s lives and thoughts was the highlight of his visit.